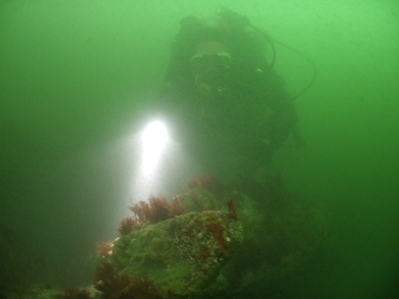 Several years ago, Tyneside 114 use to dive its own secret wreck.  Originally, Dave Simpson had discovered the site, whilst he was completing survey work for one of the local water companies. Trips were made in secret, to avoid other divers finding this wreck. Situated in 30 metres of water, what marked this wreck out from others was that she still had all of valuable fittings in place. There was something magical about shining your torch into the jumble of wreckage, with the top of the brass helm clearly visible. whilst nearby also lay the telegraph. Her bow lie twisted and upturned, whilst further back her boiler has spilled out and rolled across the seabed. Further back the remains of the hull are more upright with a gun mount still standing proud. Here too could be found the remains of brass shells, whilst the gun itself had fallen off its mount onto the seabed below. The fact that his small wreck had a sizable gun mounted on its hull clearly indicated that this vessel was lost in war rather than peacetime. Its relative small size seemed to point to it being possibly one of the numerous steam trawlers that were requisitioned by the Admiralty in both World Wars and which were used as coastal minesweepers and patrol craft. Inevitably some of these vessels were lost to accident and enemy action. What however was the identity and history of this mystery wreck? More recently however, I learnt that others had also located this wreck. Word was out that one of the local dive charter boats had salvaged the gun from the seabed. It was time to revisit the wreck to see if would give up any more of its lost secrets. With relatively calm water and slack water, the descent down the shot line initially seemed promising, however the deeper one descended the more the light dimmed until at 20 metres one entered into a world of total darkness only illuminated by the beams of torch light. 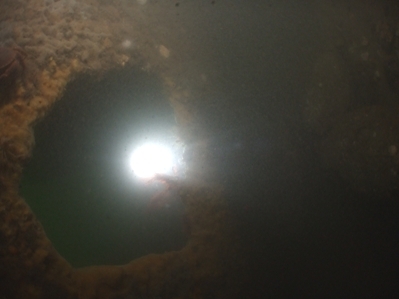 Ten metres further down, and it was evident that the shot had landed close to the stern area of the wreck as the torch beam illuminated the remains of the gun mount. It was soon evident however that a combination of nitrogen narcosis and careless fin strokes had contrived to restrict visibility even further as one swam forward into clouds of billowing silt. For Trevor and Maurice however, this situation was to have fortunate consequences; as having ‘clipped off’ the shotline they headed out only to discover that they had swam away from the main area of wreckage. Suddenly, there on the seabed was the unmistakable outline of a ships bell standing perfectly intact and upright on the seabed. Not believing his luck Trevor unfurled his lifting bag before attaching it to the bell and sending it upwards back to the surface. Once back at the surface, the bell was safely recovered. Careful scrapping of its thin covering of marine growth quickly uncovered various letters, revealing the name of the mystery wreck, the SS Humber! Built in 1899 this small cargo vessel of 280 tonnes was constructed and launched from the Ardrossan Dockyard and Ship building Co Ltd. Later, at some point during the First World War, the SS Humber had been turned into an armed merchant vessel when she was equipped with a single deck gun mounted on her stern. On the 25/01/1918, the SS Humber was nearing the end of her passage from Lynn to Dunston, when she was hit by a U-boat torpedo and quickly sank with the loss of seven lives of her crew, including the ships master. 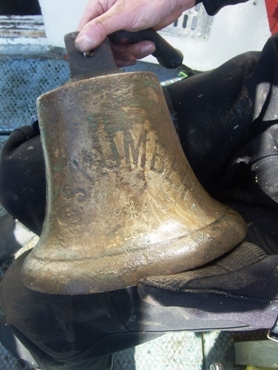 She remained on the seabed, lost and mysterious until the chance finding of her bell that confirmed the actual identity of the wreck. Despite the difficult and challenging underwater conditions, the sea had chosen to give up one of its secrets. The final resting place of the SS Humber and her lost crew had finally been revealed. For the second dive we headed back north in the hope of finding clearer water. The chosen site was another mysterious wreck whose identity has been lost in time. This particular vessel lays in only 8 metres of water, quite close in to the shore off South Shields. Would the sea give up any more of her secrets? Sadly on this occasion the answer was no. Instead we clung to the wreckage as an ever-increasing swell past overhead resulting in something of an uncomfortable and disorientating dive. 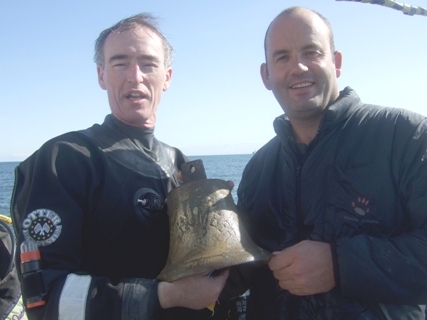 The discovery of the ships bell and the identity of the first mysterious wreck more than made up for the poor diving conditions.